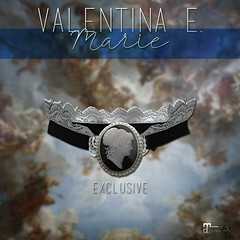 November 2015 – Valentina E.
VALENTINA E. BLACK FRIDAY+ SALE! ON NOW at Valentina E. 50% off EVERYTHING STORE WIDE, main location only Friday November 27th – Sunday November 29th (midnight SLT). Don’t miss this incredible sales event, our VERY FIRST in our three year history! NEW! Valentina E. Joey Ensemble @ Uber! NEW! Valentina E. Joey Ensemble @ UBER! Cotton Tank & Leather Leggings with Belt & Oversized Striped Sweater, all available in four color options, Maitreya, Slink Physique, Fitmesh, & Standard Sizes. NEW! Valentina E. Noell Knit Ensemble @ Tannenbaum! NEW for Tannenbaum opening November 25th The Valentina E. Shortie Cable Knit Sweater & Belted Dress! Maitreya, Slink, Fitmesh, & Standard Sizes included. Don’t miss it! NEW! 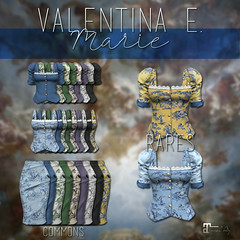 Valentina E. Dazzled Ensemble @ The Fantasy Collective! Coming to The Fantasy Collective, the new Valentina E. Dazzle Bra & Leggings! Maitreya, Slink, Fitmesh, and Standard Sizes included. Don’t miss it! NEW! Valentina E. Lauren Belted Dress @ ON9! NEW! Valentina E. Lauren Belted Dress in standard, fitmesh, and Slink Physique sizes, exclusively at ON9!